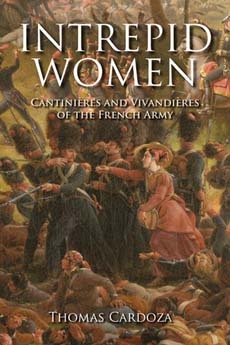 Cahiers du Genre et Recherches féministes, "Les antiféminismes"
Cantinières and vivandières were women who served as official, uniformed combat auxiliaries of French army units from 1793 to the eve of World War I. Technically non-combatant spouses of active-duty soldiers, they fought and died in every conflict from the wars of the Revolution through colonial campaigns in Algeria, Mexico, West Africa, and Indochina. At a time when women were strictly controlled by the Napoleonic Code, cantinières owned property, traveled widely, and exercised a fierce independence from their husbands. However, despite their actions, they passed largely under the radar of the growing feminist and anti-feminist movements that flourished in France from 1792 onward. Based on extensive archival research as well as published sources, Intrepid Women is the first serious book-length study of a previously ignored aspect of women’s and military history.